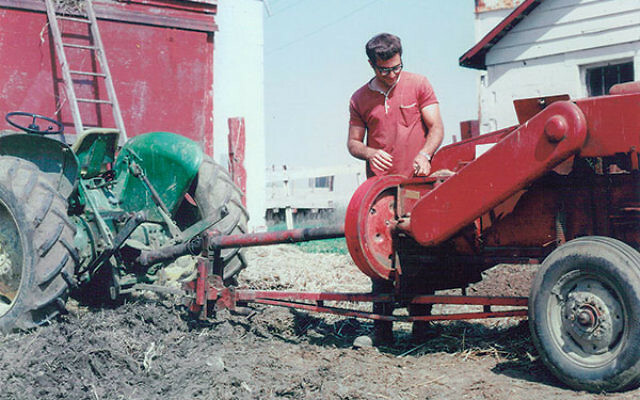 Micha Livne repairs a hay baler while serving as a shaliah on the Hechalutz Farm in the late ’60s. Well before the State of Israel was established in 1948, American Jews planning to make aliya received training to establish or join kibbutzim. One such effort that took place close to home was the 208-acre Hechalutz Farm near Hightstown. On Wednesday, May 11, the Israel Affairs Committee of Beth El Synagogue in East Windsor will offer “A Journey through Time: Highlighting a Local Contribution to Fulfilling the Zionist Dream.” The program will feature a slide/video presentation with 50 pictures of the farm from the early years and an interview with a local resident who served as a shaliah to the farm in the ’60s. The farm supplied tomatoes to the Campbell Soup Company in Trenton and eggs to customers there and in Philadelphia. By 1964 the farm was selling milk from its 30 Holstein cows. It also grew such field crops as alfalfa, corn, and soybeans. A sheet-metal worker and farm member helped establish Pioneer Sheet Metal at the facility to produce equipment for neighboring poultry farmers. An electronics specialist and a maritime electrician, residents of the farm, maintained their jobs on the outside but contributed their incomes to its budget. During World War II women did the bulk of the work, and although by the 1950s young people often chose to train on actual kibbutzim in Israel, the farm persevered until 1974. When Livne arrived, at age 27, the farm had already changed from its early days. “When they started, everybody, before they went to Israel, had to go there for training,” he said. During his tenure, the trainees who made aliya joined Kibbutz Gal-On, midway between Tel Aviv and Be’er Sheva, as a group. “By that time they didn’t start a new kibbutz. Wherever the movement decided to use more people, that’s where they went,” he said. Hashomer Hatzair, Livne said, was “really very left-wing” and early on, before the truth came out about Soviet leader Josef Stalin, he was the movement’s “big idol.” Strongly anti-capitalist, Hashomer Hatzair later moved toward the center politically, but still remained more left-leaning than other movements, he said. By 1968-69, when he arrived, Livne said, the farm was on its way out. The number of trainees went down because by the 1960s, those planning to join a kibbutz or farming community as olim could more easily go directly to Israel to learn how to do the work. 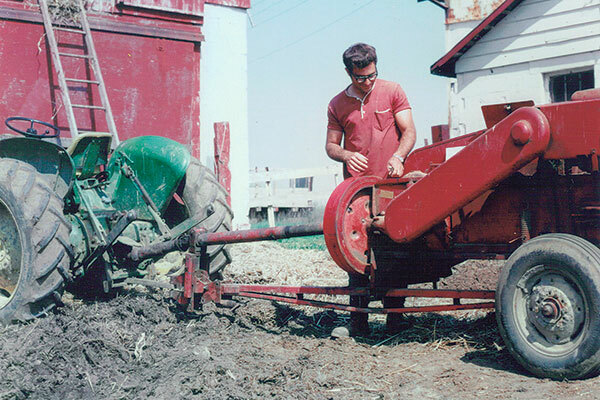 With fewer people on the Hechalutz farm, it was harder to get the work done. “You never knew how many were going to be there,” Livne said. “Some just came weekends.” Finally, he said, “the upkeep and maintenance was getting expensive,” and the farm was closed in 1974. At the height of its operation, the workers lived in a huge house that had a gym and a big kitchen, and the farm hosted hundreds of people on weekends for seminars, Livne said. But as the population became reduced, they moved into a second, smaller house on the property. In Livne’s time, the farm still ran workshops. The May 11 event will feature ceremonies for Yom Hazikaron and Yom Ha’atzmaut, including a moment of silence for Israel’s fallen soldiers and a broadcast of the 1947 United Nations vote on Israel’s independence. Hillel Zaremba, director of community relations and new media at the Consulate General of Israel, will also address the gathering.